This article is about the proposed NASA mission. For asteroid mining and utilization, see Asteroid mining. Grippers on the end of the robotic arms are used to grasp and secure a boulder from a large asteroid. Once the boulder is secured, the legs would push off and provide an initial ascent without the use of thrusters. The Asteroid Redirect Mission (ARM), also known as the Asteroid Retrieval and Utilization (ARU) mission and the Asteroid Initiative, was a space mission proposed by NASA in 2013. The Asteroid Retrieval Robotic Mission (ARRM) spacecraft would rendezvous with a large near-Earth asteroid and use robotic arms with anchoring grippers to retrieve a 4-meter boulder from the asteroid. The spacecraft would characterize the asteroid and demonstrate at least one planetary defense technique before transporting the boulder to a stable lunar orbit, where it could be further analyzed both by robotic probes and by a future human mission, ARCM (Asteroid Redirect Crewed Mission). If funded, the mission would have launched in December 2021, with the additional objectives to test a number of new capabilities needed for future human expeditions to deep space, including advanced ion thrusters. The proposed 2018 NASA budget called for its cancellation, the mission was given its notice of defunding in April 2017, and NASA announced the "close out" in June 13, 2017. Key technologies being developed for ARM will continue, especially the ion thruster propulsion system that would have been flown on the robotic mission. The main objective of the Asteroid Redirect Mission was to develop deep space exploration capabilities needed in preparation for a human mission to Mars and other Solar System destinations per NASA's Journey to Mars flexible pathways. Space tug missions, to disaggregate non-time-critical Mars logistics from crew, can reduce the costs by as much as 60% (if using advanced solar electric propulsion (ion engines)) and reduces overall mission risk by enabling on-site check-out of critical systems before the crew departs. Not only would the solar electric propulsion (SEP) technologies and designs be applied to future missions, but the ARRM spacecraft would be left in a stable orbit for reuse. The project has baselined any of multiple refueling capabilities; the asteroid-specific payload is at one end of the bus, for possible removal and replacement via future servicing, or as a separable spacecraft, leaving a qualified space tug in cislunar space. The robotic and crewed missions would demonstrate capabilities past Earth orbit, yet within a few days' return contingency. Lunar Distant Retrograde Orbit (DRO), encompassing Earth-Moon L1 and L2, is essentially a node for Earth system escape and capture. This is more so if an Exploration Augmentation Module (EAM) is brought for extended human stays, possibly by an ARRM-like SEP module. On its return leg from Mars, a human mission may save tons of mass by capturing into DRO, and transferring to a parked Orion for Earth return and reentry. A secondary objective was to develop the required technology to bring a small near-Earth asteroid into lunar orbit – "the asteroid was a bonus." There, it could be analyzed by the crew of the Orion EM-5 or EM-6 ARCM mission in 2026. Additional mission aims included demonstrating planetary defense techniques able to protect the Earth in the future – such as using robotic spacecraft to deflect potentially hazardous asteroids. Under consideration for deflecting an asteroid are: grabbing the asteroid and directly moving it, as well as employing gravity tractor techniques after collecting a boulder from its surface to increase mass ("enhanced gravity tractor"). The mission would also test the performance of advanced solar electric propulsion (ion engines) and broad-band laser communication in space. These new technologies would help send the large amounts of cargo, habitats, and propellant to Mars in advance of a human mission to Mars and/or Phobos. Asteroid grippers on the end of the robotic arms are used to grasp and secure a 6 m boulder from a large asteroid. An integrated drill would be used to provide final anchoring of the boulder to the capture mechanism. Rendering of the Asteroid Redirect Vehicle departing the asteroid after capturing a boulder from its surface. The vehicle would land on a large asteroid and grippers on the end of the robotic arms would grasp and secure a boulder from the surface of a large asteroid. The grippers would dig into the boulder and create a strong grip. An integrated drill would be used to provide final anchoring of the boulder to the capture mechanism. Once the boulder is secured, the legs would push off and provide an initial ascent without the use of thrusters. The spacecraft would be propelled by advanced solar electric propulsion (SEP) (possibly a Hall effect thruster, see Ion thruster). Electricity would be provided by high efficiency UltraFlex-style solar panels (50 kW). The advanced ion engine uses 10% of the propellant required by equivalent chemical rockets, it can process three times the power of previous designs, and increase efficiency by 50%. It would use the Hall-effect, which provides low acceleration but can fire continuously for many years to thrust a large mass to high speed. Hall effect thrusters trap electrons in a magnetic field and use them to ionize the onboard xenon gas propellant. The magnetic field also generates an electric field that accelerates the charged ions creating an exhaust plume of plasma that pushes the spacecraft forward. The spacecraft concept would have a dry mass of 5.5 tons, and could store up to 13 tons of xenon propellant. Each thruster would have a 30- to 50-kilowatt power level, and several thrusters can be combined to increase the power of an SEP spacecraft. This engine, which is scalable to 300 kilowatts and beyond, is being researched and developed by Northrop Grumman with Sandia National Laboratories and the University of Michigan. NASA Glenn Research Center is managing the project. Even at a destination, the SEP system can be configured to provide power to maintain the systems or prevent propellant boil-off before the crew arrives. However, existing flight-qualified solar-electric propulsion is at levels of 1–5 kW. A Mars cargo mission would require ~100 kW, and a crewed flight ~150–300 kW. Originally planned for 2017, then 2020, and then for December 2021. The mission was given its notice of defunding in April 2017. The launch vehicle would have been either a Delta IV Heavy, SLS or Falcon Heavy. The boulder would have arrived in lunar orbit by late 2025. As of October 29, 2017[update], 16,950 near-Earth asteroids are known, having been discovered by various search teams and catalogued as potentially hazardous objects. By early 2017 NASA had yet to select a target for ARM, but for planning and simulation purposes it used a near Earth asteroid named (341843) 2008 EV5 of about 400 m (1,300 ft) in diameter to pick up a single 4 m (13 ft) boulder from it. Other candidate parent asteroids were Itokawa, Bennu, and Ryugu. The carbonaceous boulder that would have been captured by the mission (maximum 6 meter diameter, 20 tons) is too small to harm the Earth because it would burn up in the atmosphere. Redirecting the asteroid mass to a distant retrograde orbit around the Moon would ensure it could not hit Earth and also leave it in a stable orbit for future studies. NASA Administrator Robert Frosch testified to Congress on "asteroid retrieval to Earth" in July 1980. However, he stated that it was infeasible at the time. The ARU mission, excluding any human missions to an asteroid which it may enable, was the subject of a feasibility study in 2012 by the Keck Institute for Space Studies. The mission cost was estimated by the Glenn Research Center at about $2.6 billion, of which $105 million was funded in 2014 to mature the concept. NASA officials emphasized that ARM was intended as one step in the long-term plans for a human mission to Mars. The 'Option A' was to deploy a container large enough to capture a free-flying asteroid up to 8 m (26 ft) in diameter. 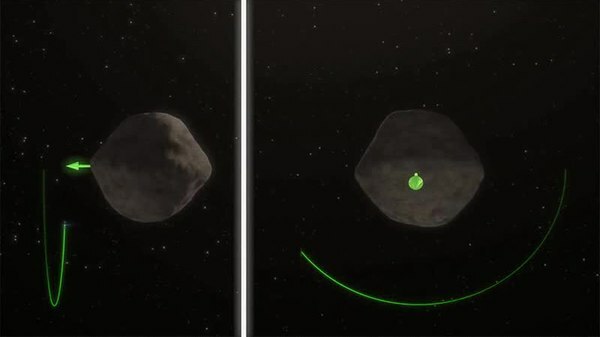 The two options studied to retrieve a small asteroid were Option A and Option B. Option A would deploy a large 15-metre (50 ft) capture bag capable of holding a small asteroid up to 8 m (26 ft) in diameter, and a mass of up to 500 tons. Option B, which was selected in March 2015, would have the vehicle land on a large asteroid and deploy robotic arms to lift up a boulder up to 4 m (13 ft) in diameter from the surface, transport it and place it into lunar orbit. This option was identified as more relevant to future rendezvous, autonomous docking, lander, sampler, planetary defense, mining, and spacecraft servicing technologies. The crewed portion to retrieve asteroid samples from the Moon orbit (Orion EM-3) was criticized as an unnecessary part of the mission with claims that thousands of meteorites have already been analyzed and that the technology used to retrieve one boulder does not help develop a crewed mission to Mars. The plans were not changed despite the NASA Advisory Council suggested on April 10, 2015 that NASA should not carry out its plans for ARM, and should instead develop solar electric propulsion and use it to power a spacecraft on a round-trip flight to Mars. In January 2016 contracts were awarded by NASA's Jet Propulsion Laboratory (JPL) for design studies for a solar electric propulsion-based spacecraft. The robotic ARRM mission would have been the first phase of ARM. The contracts were won by Lockheed Martin Space Systems, Littleton, Colorado; Boeing Phantom Works, Huntington Beach, California; Orbital ATK, Dulles, Virginia; and Space Systems/Loral, Palo Alto, California. In May 2016, ASI (the Italian Space Agency) agreed to a joint study, and possible Italian participation. Under the 2018 NASA budget proposed by the Trump administration in March 2017, this mission was cancelled. In June 13, 2017 NASA announced a "closeout phase" following the defund. NASA has emphasized that key technologies being developed for ARM will continue, especially the solar electric propulsion system that would have been flown on the robotic mission. ^ a b c Foust, Jeff (March 3, 2016). "NASA slips schedule of Asteroid Redirect Mission". SpaceNews. Retrieved March 6, 2016. ^ Agle, DC (April 10, 2013). "NASA Associate Administrator on Asteroid Initiative" (Press release). Washington, DC: JPL. Retrieved March 29, 2015. ^ a b Harwood, William (March 16, 2017). "Trump budget blueprint focuses on deep space exploration, commercial partnerships". Spaceflight Now. Retrieved March 17, 2017. ^ a b c d e Jeff Foust (June 14, 2017). "NASA closing out Asteroid Redirect Mission". Space News. Retrieved September 9, 2017. ^ a b c d e f Cassady, J.; Maliga, K.; Overton, S.; Martin, T.; Sanders, S.; Joyner, C.; Kokam, T.; Tantardini, M. (2015). "Next Steps in the Evolvable Path to Mars". Proceedings of the IAC. ^ a b Manzanek, D. (May 20, 2016). The Asteroid Redirect Mission. USNO Scientific Colloquium. ^ a b c d Troutman, P. (July 30, 2014). The Evolvable Mars Campaign: the Moons of Mars as a Destination. ^ a b Gates, M.; Manzanek, D. (June 28, 2016). Asteroid Redirect Mission (ARM). 15th Meeting of the NASA Small Bodies Assessment Group. ^ Brophy, J.; Friedman, L.; Strange, N.; Prince, T.; Landau, D.; Jones, T.; Schweickart, R.; Lewicki, C.; Elvis, M.; Manzella, D. (October 2, 2014). Synergies of Robotic Asteroid Redirection Technologies and Human Space Exploration. 65th International Astronautical Congress (IAC-2014), 29 September – 3 October 2014, Toronto, Canada. International Astronautical Federation. pp. Art. No. IAC–14.A5.3. ^ a b c d e f Craig, D. Evolvable Mars Campaign. Jun 10 2015. ^ a b c Elvis, M. (August 11, 2014). "ARM and the Mars Forward NASA". ^ a b c d e Tate, Karl (April 10, 2013). "How to Catch an Asteroid: NASA Mission Explained (Infographic)". Space.com. TechMediaNetwork. Retrieved March 26, 2015. ^ Howell, E. (May 8, 2015). "Human Mars Plan: Phobos by 2033, Martian Surface by 2039?". space.com. Retrieved October 9, 2016. ^ McElratht, T.; Elliott, J. (January 2014). "There and Back again: Using planet-based SEP tugs to repeatably aid interplanetary payloads". Advances in the Astronautical Sciences (152): 2279–2298. ^ Price, Humphrey W.; Woolley, Ryan; Strange, Nathan J.; Baker, John D. (2014). "Human Missions to Mars Orbit, Phobos, and Mars Surface Using 100-kWe-Class Solar Electric Propulsion". AIAA SPACE 2014 Conference and Exposition. doi:10.2514/6.2014-4436. ISBN 978-1-62410-257-8. ^ Manzanek, D.; Reeves, D.; Hopkins, J.; Wade, D.; Tantardini M.; Shen, H. (April 13, 2015). "Enhanced Gravity Tractor Technique for Planetary Defense". Iaa-Pdc. ^ NASA RFI: Spacecraft Bus Concepts to Support the ARM and In-Space Robotic Servicing- Section "Separable Spacecraft Architecture ARRM Concept". ^ Moore, C. (January 2014). "Technology development for NASA's asteroid redirect mission" (PDF). IAC-14-D2.8-A5.4.1. ^ Conte, D. DiCarlo, M. Ho, K. Spencer, D. Vasile, M. (August 28, 2015). "Earth-Mars Transfer through Moon Distant Retrograde Orbits" (PDF). Acta Astronautica (Submitted manuscript). 143: 372–379. Bibcode:2018AcAau.143..372C. doi:10.1016/j.actaastro.2017.12.007. ^ Gong, S.; Li, J. (September 1, 2015). "Asteroid Capture Using Lunar Flyby". Advances in Space Research. 56 (5): 848–858. Bibcode:2015AdSpR..56..848G. doi:10.1016/j.asr.2015.05.020. ^ Englander, J.; Vavrina, M. Naasz, B. Merill, R. Qu, M. "Mars, Phobos, and Deimos Sample Return Enabled by ARRM Alternative Trade Study Spacecraft". Aiaa 2014. ^ a b c d e Foust, Jeff (March 25, 2015). "NASA Selects Boulder Option for Asteroid Redirect Mission". SpaceNews. Retrieved March 27, 2015. ^ a b How Will NASA's Asteroid Redirect Mission Help Humans Reach Mars?. NASA, June 27, 2014. ^ a b c "NASA Announces Next Steps on Journey to Mars: Progress on Asteroid Initiative". NASA. March 25, 2015. Retrieved March 25, 2015. ^ a b NASA YouTube video:ARM, 'Option B': Boulder collection from a large asteroid. ^ a b c Malik, Tariq (March 27, 2015). "Obama Seeks $17.7 Billion for NASA to Lasso Asteroid, Explore Space". Space.com. TechMediaNetwork. Retrieved April 10, 2013. ^ a b c Erin Mahoney. "What Is NASA's Asteroid Redirect Mission?". NASA.GOV. NASA. Retrieved July 6, 2014. ^ Bamsey, M. "Investigation of a Phobos Sample Return Mission". Retrieved September 14, 2016. ^ Hoffman, S. "A Phobos-Deimos Mission as an Element of the NASA Mars Design Reference Architecture 5.0". Second International Conference on the Exploration of Phobos and Deimos 2011. ^ Strange, N.; Merrill, R.; et al. "Human Missions to Phobos and Deimos Using Combined Chemical and Solar Electric Propulsion". 47th AIAA/ASME/SAE/ASEE Joint Propulsion Conference & Exhibit. ^ "Human Mars Plan: Phobos by 2033, Martian Surface by 2039?". Retrieved September 14, 2016. ^ Duggan, Matthew (December 2015). "The Path to Mars" (PDF). Retrieved September 14, 2016. ^ "Mars Base Camp". Retrieved September 14, 2016. ^ "Emerging Capabilities for the Next Mars Orbiter" (PDF). Archived from the original (PDF) on October 5, 2016. Retrieved September 14, 2016. ^ "The New Orbit-first Consensus". Retrieved September 14, 2016. ^ Lee, P.; Hoftun, C.; et al. (2012). "Phobos and Deimos: Robotic Exploration in Advance of Humans to Mars Orbit". Concepts and Approaches for Mars Exploration 2012. 1679: 4363. Bibcode:2012LPICo1679.4363L. ^ Price, H.; Baker, J.; et al. "Human Missions to Mars Orbit, Phobos, and Mars Surface Using 100-kWe-Class Solar Electric Propulsion". AIAA Space 2014 Conference and Expo Proceedings. ^ Percy, T.; McGuire, M.; et al. "Combining Solar Electric Propulsion and Chemical Propulsion for Crewed Missions to Mars". Ntrs 20150006952. ^ John Brophy; Fred Culick; Louis Friedman; et al. (April 12, 2012). "Asteroid Retrieval Feasibility Study" (PDF). Keck Institute for Space Studies, California Institute of Technology, Jet Propulsion Laboratory. Table 1: Asteroid Mass Scaling (for spherical asteroids). Page 17. ^ a b "NASA Calls for American Industry Ideas on ARM Spacecraft Development". SpaceRef. October 22, 2015. Retrieved October 23, 2015. ^ a b c d e Foust, Jeff (March 27, 2015). "NASA's Choice for Asteroid Redirect Mission May Not Sway Skeptics". SpaceNews. Washington DC. Retrieved March 28, 2015. ^ Advanced Solar Arrays: Powering Exploration. NASA. ^ a b "Hall Thruster Research: Propelling Deep Space Missions". SpaceRef. March 31, 2015. Retrieved March 31, 2015. ^ a b Brophy, John; Culick, Fred; Friedman and al, Louis (April 12, 2012). "Asteroid Retrieval Feasibility Study" (PDF). Keck Institute for Space Studies, California Institute of Technology, Jet Propulsion Laboratory. ^ Solar Electric Propulsion (SEP). NASA. ^ a b Blake, Mary (January 31, 2012). "Northrop Grumman Tapped by NASA to Develop Solar Electric Propulsion Flight Concepts for Future Space Missions". Northrop Grumman Corporation. Retrieved March 31, 2015. ^ "Why ARM?". January 21, 2015. Retrieved October 9, 2016. ^ a b Gates, Michele (July 28, 2015). "Asteroid Redirect Mission Update" (PDF). NASA. Retrieved September 6, 2015. ^ "Near-Earth Asteroid Discovery Statistics". NASA/JPL CNEOS. October 25, 2017. Retrieved October 29, 2017. ^ "H. Rept. 114–153 - SPACE RESOURCE EXPLORATION AND UTILIZATION ACT OF 2015". Retrieved October 2, 2016. ^ "Human Asteroid Exploration: The Long And Storied Path". Retrieved September 14, 2016. ^ Steitz, D. "NASA seeks additional information for asteroid redirect mission spacecraft". phys.org. Retrieved October 10, 2015. ^ Ticker, R. (August 2015). "NASA's In-Space Robotic Servicing". Proceedings, AIAA SPACE 2015 Conference and Exposition: 4644. ^ Grush, Loren (August 7, 2014). "Everyone Hates NASA's Asteroid Capture Program". Popular Science. Retrieved March 27, 2015. ^ Staff (April 13, 2015). "News from the 31st Space Symposium: Bolden Not Concerned About ARM Criticism". SpaceNews. Retrieved April 15, 2015. ^ "Companies Selected to Provide Early Design Work for Asteroid Redirect Robotic Mission Spacecraft". NASA. January 27, 2016. Retrieved January 30, 2016. ^ "Asteroid Redirect Mission: robotic collaboration between NASA and ASI". Retrieved September 14, 2016. Video: Asteroid Redirect Mission, 'Option A', Capture of an 8m free-flying asteroid. Video: Asteroid Redirect Mission, 'Option B', Boulder collection from a large asteroid.